I've been using Mixed Chicks products for a while now and they have never let me down. I still remember the Mixed Chicks wasn't available in the UK and my mum was trying to find a way to get them shipped over to London without costing a bomb. I'm not overly fussy with my hair, but when I'm in a rush and I don't have time to see the result after drying this is my go to product as I always know what I'm going to get. It's really lightweight so it doesn't weigh hair down, and once dry my curls are left looking shiny and healthy. I've spoken about this product in more detail here in an old YouTube video. I LOVE this product. This is mine and my sisters' staple deep conditioner and I actually need to replace it as it has basically run out. I got this in the summer and have been using it sparingly until now. The treatment smells absolutely amazing. With the main ingredients being banana and cocoa butter, it smells like you're baking a cake in the shower! After using this my hair feels softer, shinier and completely moisturised. I would recommend this product to any curly girls who hair is looking dull and lifeless. I've spoken about this product before, but this is my holy grail for luscious curls! Not only does it smell absolutely amazing, but it makes my hair so soft and bouncy leaving it with a natural looking shine. My hair doesn't take too well to products sometimes, so when I first used the CH Smoothie it didn't work for me. As my hair has grown and has bettered in condition, this product has been an absolute lifesaver. I also use this when I need to slick my hair back into a bun or ponytail, or if I want to revive my curls before heading out. This is my "If I were stuck on a desert island and could only take one hair product" product! This is a new addition to my hair product shelf. I received the moisturiser in my Happy Froday Lunch goodie bag in the summer, and I only started using it a few months ago. I really dislike trying new products as I'm definitely a "if it's not broken, don't fix it" kind of girl, but the first time I used this I was in a mega rush and was surprised when I got some amazing compliments on my hair that day. Even my mum made a comment, so I know it looked good! This product is a little thinner in consistency than I'm used to but it smells gorgeous and I've been pairing it with the CH Smoothie for extreme curl optimisation. I'm a huge fan of this product and am looking forward to trying more from this brand. I received my first Tangle Teezer a few years ago at a feelunique.com event I went to when I was freelance blogging. 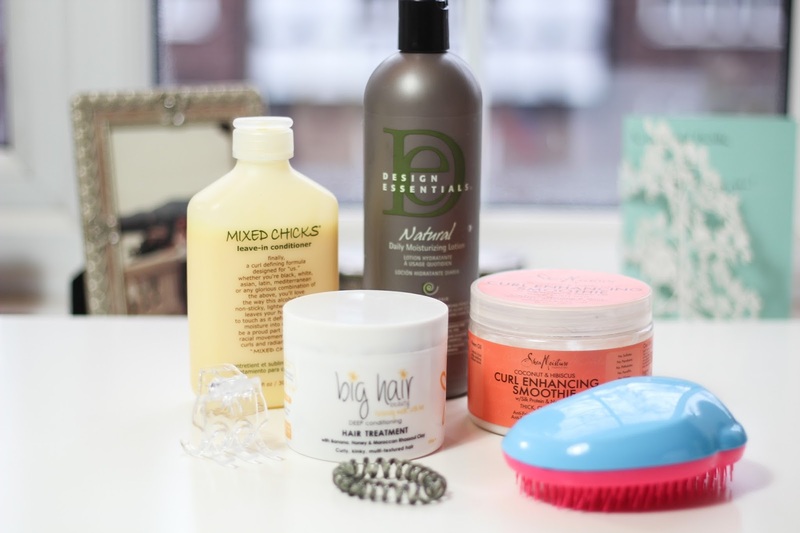 I loved it when I wore my hair straight as it is perfect for on the go, but with my hair in it's current natural curly state it is a completely different tool. I seriously don't remember what it was like to detangle my hair without this tool, and I don't ever want to! I have a few in my possession now and have started leaving them at people's houses that I know I could possibly need to wash my hair at for whatever reason. My nieces even have the kid's versions so that they would start enjoying the detangling process, rather than being scared of it. I thought I was so ahead of the game when I received these babies, but everyone and their mum is using them now! It's amazing how something so simple can make such a difference not only in how your ponytail or bun looks, but in the comfort levels you feel with said pony-tail or bun! I always have one on my wrist, these are a must! I've recently bought some hair clips as I've been finding washing my face more and more difficult as my hair has grown, and I don't really like tying my hair up if it's down. I'm sure this is nothing new to most of you but I couldn't believe that I didn't own any hair clips until like a month ago! I know what you mean about the Shea moisture curl enhancer. When I first used it, it didn't work well for me either but now that my hair has grown its a live saver product and my go to! I'm gonna have to try the Big Hair deep conditioning treatment. I dye my hair occasionally so this product sounds perfect for me.